Call Or Click For Cheap Travel Insurance! Make sure you are protected while you travel outside of Canada with travel insurance coverage from ThinkInsure. We'll get you flexible and affordable coverage based on your unique travel needs so you can enjoy your trip to the fullest. Peace Of Mind : There is no substitute for having the peace of mind in knowing you are covered if your trip doesn’t go according to plan. Financial Protection : You are protected from expensive out of country medical bills and other unforeseen travel expenses that could pop up during your trip. Missed Flight Coverage : Missed and cancelled flights are part of travelling. Get protection for missed flights. Protection For Your Baggage : Bags get lost during trips. Protect yourself from lost, stolen or damaged baggage. Get your travel insurance now! Call toll free 1-855-504-2039 to speak to a broker OR compare quotes online . Making travel insurance part of your trip planning is a must. 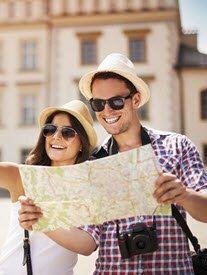 Whether you are planning a cross-border shopping trip to the U.S., planning a cross-Canada road trip or are heading south for vacation, travel insurance provides you with the coverage you need to have a safe and worry free trip. The main reason you need travel insurance is that you never know what could happen before or during your trip. A job loss, sudden illness, or death in the family could force you to cancel your trip before it even happens. Once you leave, severe weather, flight delays, lost luggage, or even a medical emergency could bring your trip to a halt. Without travel insurance coverage, your dream trip could become a real life nightmare, and one that will leave you disheartened and left with an expensive bill to overcome your travel issues. One of the biggest misconceptions about travel insurance for Canadian travelers is that they only need it when they are travelling outside of Canada. However, this is not true. Anytime you travel outside of your home province, you should get travel insurance to protect the investment in your trip. Limited OHIP Protection : Your government health insurance plan (OHIP) covers only very limited amounts for hospital, health facility and physician services outside of Ontario and Canada. OHIP does not pay for ambulance services, transportation costs, or out-of-hospital food/accommodation/drugs or prescriptions. Flight Delays And Cancellations Are Common : According to the Department of Transportation, since 2003, almost 2% (1.75) of flights get cancelled, and just under 22% (21.93) fail to reach their destination on time. Limited Coverage From Credit Cards : Many credit cards offer travel insurance coverage. However, what many people fail to realize is that there are limits on coverage and the amount you can claim. Baggage Is Mishandled Or Lost : In 2014, there were over 1.6 million cases of mishandled baggage reported in the United States in the first nine months. Why Get Your Travel Insurance With ThinkInsure? We can quickly get you the travel insurance coverage you need for your trip. This allows you to focus more important things – like sightseeing, working on your tans and relaxing - knowing that you'll be protected. Flexible Coverage Options : Mix and match the coverage you want based on your travel agenda and needs. Convenience : We’ll quickly compare quotes from 14 different travel insurance companies so you get the convenience of one stop travel insurance shopping. It’s Quick & Easy : You can get coverage online in 5 minutes or less. Just enter your info, tell us about your coverage needs, and you’ll be covered. Cheap Travel Insurance Rates : With our large partner network, we can get you the cheapest rates and prices for travel insurance coverage. Customer Service When You Need It : Get customer service any time of the day with 24/7 service hours. Wide Selection Of Coverage : Get custom tailored and comprehensive coverage to meet your unique travel needs. No Hidden Fees : There aren’t any hidden fees or administrative charges. What you see is what you get when you buy travel insurance with us. Flexibility To Change Dates : Penalty-free travel date changes. Make as many changes as you need. Cancellation Refund : Get a guaranteed full refund if you cancel your travel insurance coverage prior to your departure. Which Type Of Travel Insurance Do You Need? Your Canadian health insurance is certainly not valid when you travel outside of Canada. You may have some coverage from your work benefits plan. You should speak to a broker to make sure that you have the travel insurance coverage that will give you the best protection for your situation. Get a travel insurance quote 1-855-504-2039 OR compare quotes online. We’re here to help you get the travel insurance you need for your upcoming trip. Medical travel insurance coverage makes sure you are covered in the event of an accident or illness. You never know when you could get injured, fall ill or have a medical emergency, and having emergency medical coverage gives you the peace of mind in knowing that you can get the help you need when you need it, no matter where you are travelling. Medical insurance also covers repatriation (bringing you back home). Trips can get cancelled or interrupted for countless reasons. While it’s not something you think about when booking a vacation, it is something that could happen, and if it does, this form of travel insurance will ensure you are covered and will not have to take a financial loss. If you have to cancel your trip before you depart, or interrupt a trip due to a family emergency, poor weather or medical issue, you may be reimbursed for the lost finances up to the value of the trip. From the day you book your trip to just before departure, you’re covered. Hundreds of thousands of Canadian seniors head south each winter to get away from the cold weather. Whether they are planning a stay in Florida, Arizona, Texas or even in Mexico, having snowbird travel insurance ensures they have access to the medical care and travel assistance they need during their time outside of Canada. If you really want to put your mind at ease when travelling, then all-inclusive travel insurance is your best option. It provides travellers with complete coverage for any issue you may encounter during your trip. 1. Once you book your trip, book your travel insurance. 2. Give yourself enough time to make an informed decision – try to avoid booking travel insurance coverage at the last minute. 3. Don’t shop based on price alone – know what you are getting for the quoted price. 4. If you are not sure about a policy element or what is included, ask questions to get clarification. 5. Disclose all the details of your trip when getting a quote and booking coverage. 6. 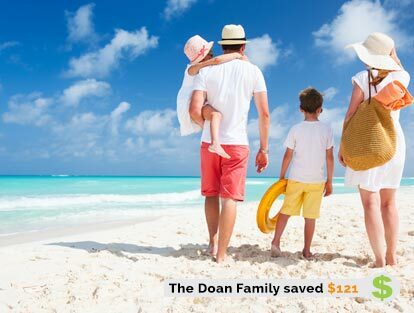 If you are travelling with your family, insure the whole family under the same policy. 7. If you are a frequent traveller, consider a multi-trip or annual travel insurance policy. Just like any other form of insurance, it’s very important to compare travel insurance quotes and explore your options before settling on an insurance policy. No two travel insurance policies are the same, and no two travellers’ insurance needs are the same. Comparing travel insurance quotes and policy options also gives you the chance to better understand the coverage options that are available to you. If you have any questions about your travel insurance coverage, contact a ThinkInsure broker today. We are here to help you with all your travel insurance needs. Call toll-free to get a travel insurance quote 1-855-504-2039 OR compare quotes online. Either way we'll get you affordable coverage so you can enjoy your trip.